Eleven Madison Park was crowned 2017′s winner of the annual World’s 50 Best Restaurants. THE CONTEMPORARY NEW York restaurant Eleven Madison Park was crowned 2017′s winner of the annual World’s 50 Best Restaurants list, only the second US establishment to win the influential if controversial award. Run by Swiss-born chef Daniel Humm in a lavish art deco building in the eye-wateringly expensive Flatiron District, the restaurant beat the 2016 winner, Italy’s Osteria Francescana, into second place. Spain’s El Celler De Can Roca came third and New York’s famed French-born Dominique Ansel – who created the “cronut” donut and croissant fusion – won best pastry chef. The highest-ranking French restaurant, Mirazur – in the Riviera town of Menton – came fourth a year after French chefs protested the list’s paucity of talent from the country famed for gastronomy. No Irish restaurants made the list. “I don’t know how I feel right now but I’m overjoyed,” said an emotional Humm, who was praised for his multi-course fine dining menu celebrating New York’s rich history and culinary traditions. “I’m so proud to be up here,” he told the glitzy ceremony in Melbourne, Australia. When I first started cooking 25 years ago, I never in my wildest dreams would have thought I’d find myself in this position. Eleven Madison Park, where an eight-to-10 course tasting menu costs $295 per head – excluding wine and taxes – is the first American restaurant to head the list since California’s French Laundry in 2004. Humm’s restaurant also has three Michelin stars – considered the most prestigious honor in the world of fine dining – and came third on the World’s 50 list last year. 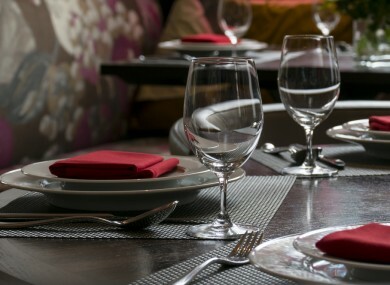 In a city packed with high-end restaurants, reservations may be relatively obtainable but all bookings are pre-paid. The restaurant is offering an 11-course menu highlighting some of its most significant dishes – an experience that lasts roughly three hours – from 11 April to 9 June, when it will close for renovations. Unusually for New York, where the tipping culture is firmly entrenched, gratuities are not accepted. The organisers said Eleven Madison Park enhanced the dining experience “with a sense of fun, blurring the line between the kitchen and the dining room”. The top 10 was rounded out by restaurants in Peru, Thailand, Austria and Spain. France, Spain and the United States dominated the top 50 with six restaurants each, while establishments from China, Chile, Hong Kong and Singapore also made the grade. The acclaimed British chef Heston Blumenthal, whose restaurant The Fat Duck in Berkshire just outside London is a former winner of the top award, received a lifetime achievement gong. Organisers said it was hard to think of another chef who had more impact on the way the world cooks. “Many of the world’s greatest restaurants use methods derived from Blumenthal and his development team’s ground-breaking research,” they said. The rankings have also been criticised for honoring few female chefs. Women took just three of the 50 spots this year, one more than in 2016. The jury comprises just over 1,000 “independent experts,” including food writers, chefs and restaurant owners, who list their choices in order of preference based on where they ate in the past 18 months. Read: What does a ‘closure order’ mean for a restaurant? Email “Dinner at the 'world's best restaurant' will set you back $295 per head (and that's just for the food)”. Feedback on “Dinner at the 'world's best restaurant' will set you back $295 per head (and that's just for the food)”.